Comfrey is a plant of the borage family that grows in moist areas, most commonly found along creeks and rivers. The dark brown roots of the plant push out fast-growing sprouts in the late spring. The bristly stalk and leaves bring forth bell-shaped violet or white-yellow blossoms that hang downward in a weeping manner. The leaves are so well bound to the stalk that they are nearly impossible to rip off the plant with bare hands. 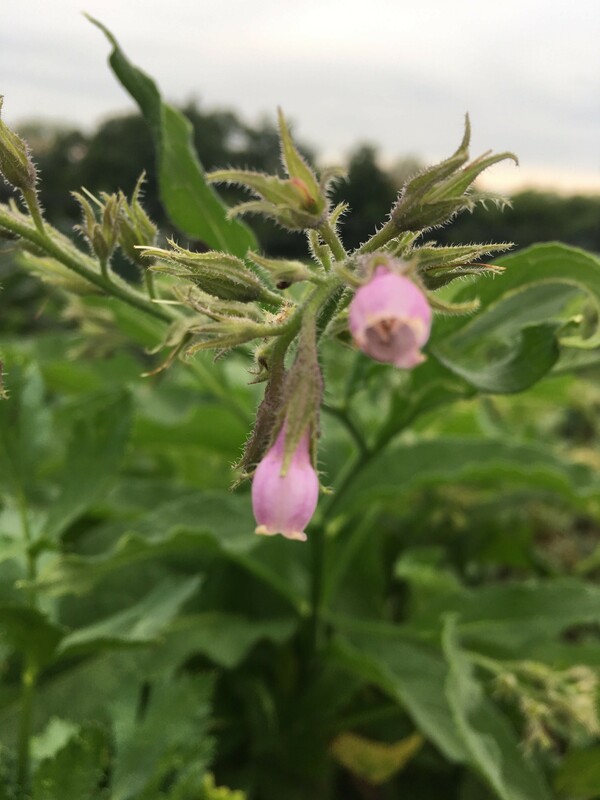 Medicinal herbalists have traditionally associated comfrey’s ability to heal its own wounds with the plant’s ability to heal human wounds. Examples of this can be found in the western European names for comfrey. The Greek name symphytum means “I grow [back] together.” The German name, Beinwell, is from the Old High German Bein wallen, which means “leg grows [back] together,” indicating that it was a popular choice for physicians treating broken legs. So famous were its healing properties in the 17th century, that the English physician and botanist Nicholas Culpeper wrote that one could cook pieces of meat in a pot with comfrey and they would grow back together. Comfrey has the highest content of allantoin of all plants. English plantain is one of the most common and most important medicinal herbs. It has been used since antiquity for both internal and external treatments, primarily digestive and respiratory ailments, as well as scorpion and insect stings. It has also been used to treat snake bites. It can be found throughout the medical and other literature of the West. Pliny the Elder praised its healing qualities and Hildegard von Bingen recorded numerous recipes for it. During the Second World War, English plantain preparations were used to treat German soldiers’ wounds on the front. It has been enjoying a renaissance lately in the medicinal herb community, even being named “2014 Medicinal Plant of the Year” by the University of Würzburg in Germany. Recent research into the plant has indicated that its high levels of aucubin are responsible for it antiseptic and antibiotic effects. This also prevents the juice of English plantain from developing mold. It is a perennial, frost-hardy plant that can grow roots up to 60cm into the ground. Comfrey Preparation: Internal use of comfrey should be sparing. Comfrey’s pyrrolizidine content is converted by liver enzymes to toxins that could damage the liver. The roots and leaves and can be used as a tincture or a salve. English Plantain Preparation: English plantain is used internally as tinctures, infusions, fresh juice, tea, tablets, lozenges, and capsules, often in combination with other medicinal herbs. In Germany, fresh English plantain juice is used as an antibiotic treatment for respiratory infections. Externally, it is most commonly used in salves and ointments for wound treatment. Discussion: For this project, I decided to make a salve of comfrey and English plantain to use on wounds on my horses. I did not really decide to use these herbs as much as I had more of them than I knew what to do. Each month over the summer, my herbal cooperative at Fox Haven Farm supplies me with different herbs. In that month, I received a rather large amount of both comfrey and plantain leaves and I ran out of ideas of what to do with them. I began by naturally drying the herbs’ leaves for a good day. I do not possess a dehydrator and I was not comfortable using the oven to dry them. After this period, they felt pretty dry, as if they had lost a lot their moisture, and I felt they had wilted enough. So, I went ahead and chopped them finely with a knife. 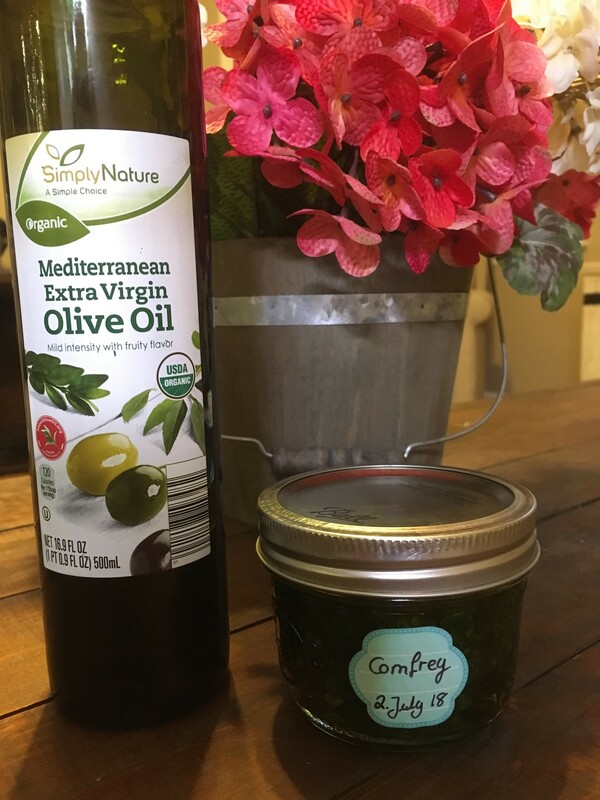 I filled an eight-ounce jar to about three-quarters full with each and then covered them with expeller-pressed organic olive oil up to the brim of the jar to prevent air contamination, sealed them tightly, and affixed a label with the start date on them. I used the solar method, placing the jars into a sunny, south-facing window and shaking them once daily for two weeks. After a few days, I got concerned that – maybe – my leaves had not wilted enough to make an oil infusion without it becoming rancid. 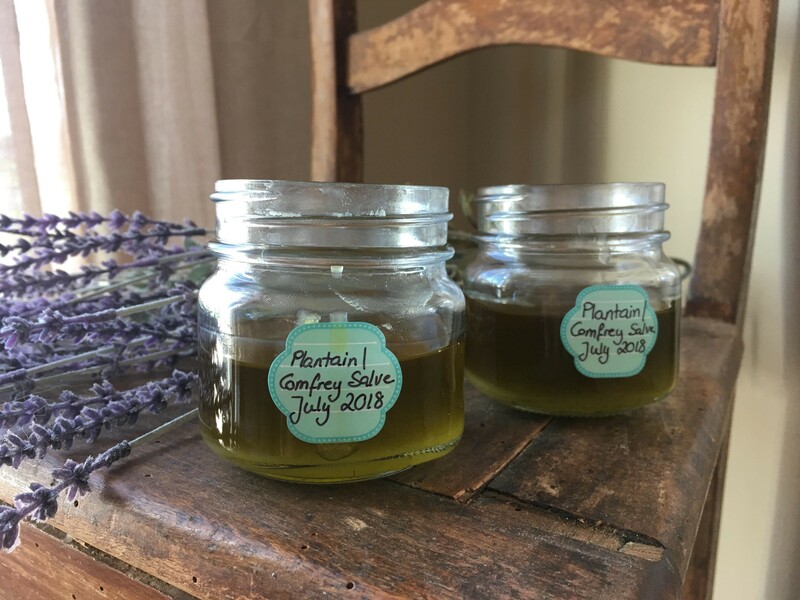 I went to my pantry and found dried comfrey and plantain leaves that I had purchased from Starwest Botanicals for treating my horses and filled two more eight-ounce jars about one-third full with the dried herbs and then filled the jars to the brim with the same olive oil. After two weeks of maceration, I opened the first two jars and discovered that my fears were correct. The oil smelled horrible and something had gone terribly wrong. So, I threw them out. Looking back, I am not sure what exactly went wrong, but it appears that there was still too much moisture in the leaves and this led to either a bacterial bloom or the oil turning rancid. I have since learned that when using fresh herbs for an infusion, I should use a breathable barrier, such as cheesecloth or a coffee filter to allow any excess moisture to escape. I will try this method the next time I make an infusion, since I would like to avoid the “hot method” of oil infusion. When the two weeks for my second batch came around, I opened the jars, and they turned out well. I strained them through a stainless steel superfine bouillon strainer, which rendered about 8-9 ounces of infused oil total. Next, I slowly warmed one ounce of beeswax together with the infused oil in a double-boiler on the stove on low heat. 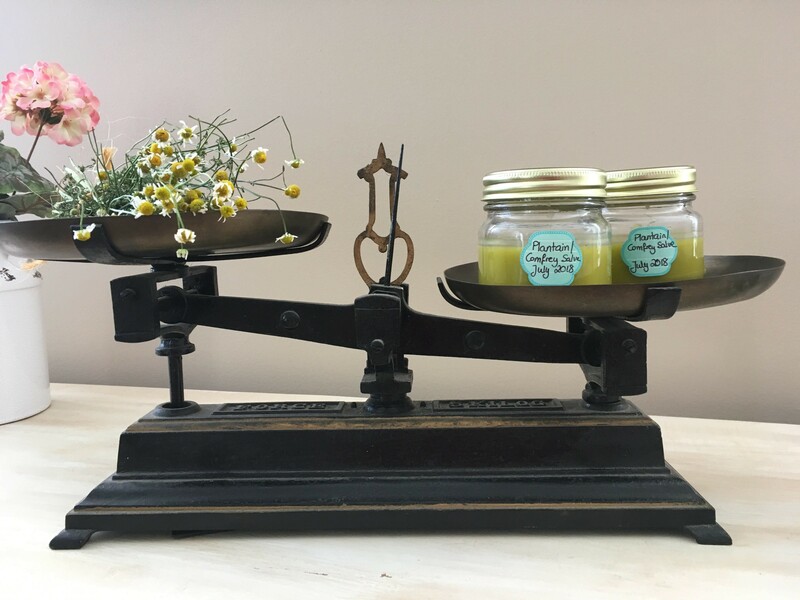 Once the beeswax was completely melted, I removed the mixture from the heat and quickly added fifteen drops of lavender essential oil to cover up any olive oil scent. I then divided it between two eight-ounce glass jars, which I labeled and let cool. Conclusion: Since this project, I have almost completely expended my supply of the salve. It has been really useful in helping my oldest horse (mid-20s) to recover for some rather nasty skin wounds. 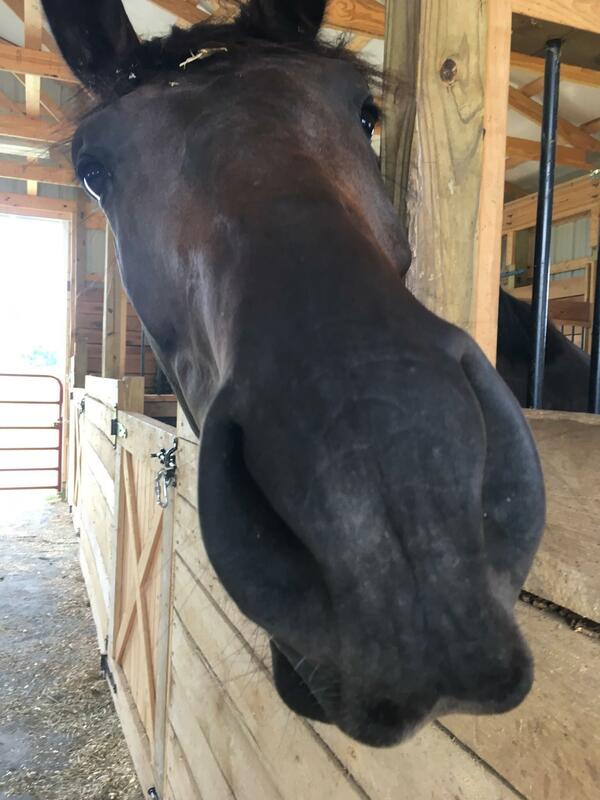 I have also been putting it on a scar on my seven-year-old gelding to test if it can help his body get rid of the scar. I have not been using it long enough to determine its effectiveness on the scar. Nonetheless, the treatment of fresh wounds for my old horse has been very encouraging and I will continue to use this salve for future wound treatments.